A newspaper is a publication intended for a broad audience that appears regularly, often daily, and claims to contain factual accounts of recent events. Usually newspapers are published with the intention of making a profit. Frequently, their factual content is accompanied by advertisements and nonfactual material intended as entertainment. Journalists often boast that they write “the rough draft of history.” The key point here is rough draft. Newspapers are written in haste and often contain inadvertent factual errors, large and small. Moreover, a newspaper’s “factual” content is determined by its point of view or bias. This point of view is shaped by the political positions taken by editors and publishers, and sometimes shaped by the newspaper’s commercial relationship with advertisers. It is also shaped by a newspaper’s location. For example, the St. Petersburg Times might call a hurricane in Florida a terrible catastrophe, while a newspaper in Idaho might ignore it entirely. Newspapers from the past contain several kinds of information for historians. They offer factual accounts of events such as earthquakes, battles, and elections. Historians often mine newspapers for basic information about who did what, when, how, and where. 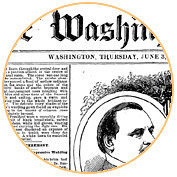 Newspapers are also filled with contextual information, such as advertisements and features, from which historians can build a more complete picture of the world in which a particular event took place.